The only problem with this gift is that it looks so fun the kids will want to get the cars out of the frames and play with them! This is a great way to re-purpose old cars you might have at home or pick up from a market, garage sale or second hand shop. They are a great way of turning old 'favourite' cars you can't bring yourself to throw away into something beautiful, interesting and unique. Play around with the colour of cars and frames that you choose - you could go for contrasting colours to make a bold statement, or tonal colours that match each other or existing decor. 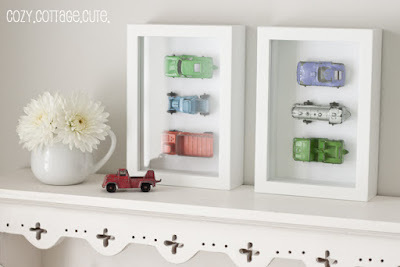 Don't limit yourself to cars - this type of display could be done for any type of object - anything from dolls for a little girl's room to Nanna's spoon collection to ceramic figurines. Precious object d'art will also be protected from kids/pets/life when displayed behind glass on the wall like this. What objects would you choose to frame in this way?